Snow is inevitably swirling down from the mountain this time of year in Red Lodge and most are delighted to break out snow gear and revel in the cold of the eighth snowiest town in the United States. Let us not forget the seasons’ change is the fabled consequence of the gods Zeus and Hades conspiring to carry Persephone away. Her mother, Demeter, was so distraught she ceased to exude her fruit bearing forces upon the earth and all were pushed into a deep winter. At last, Zeus forced Hades to return Persephone, goddess of spring’s bounty, to her mother’s realm. Unfortunately, so the story goes, Persephone had tasted food from the underworld and thus a permanent departure was prevented. Each year, as Persephone slips back to resume her role as Hades’ bride, Demeter blankets the world in ice and snow once again. Festivals of bounty and growth have been prevalent in spring when blossoms dot the tundra and plains for centuries. One such festival, usually held in May, is a five-day celebration called “Florifertum”. Offerings of milk and honey are made to the flower goddess and maidens adorn their heads with floral wreaths. Such abundance is not so different from traditional festive celebrations of the winter season. The work of Molly Hatch celebrates and elevates abundance. Her aesthetic is the cornerstone for this exhibition. Molly designed frames and niches specifically for the Red Lodge Clay Center Loft Gallery and together we assembled a group of artists who also celebrate the jewels of springtime. 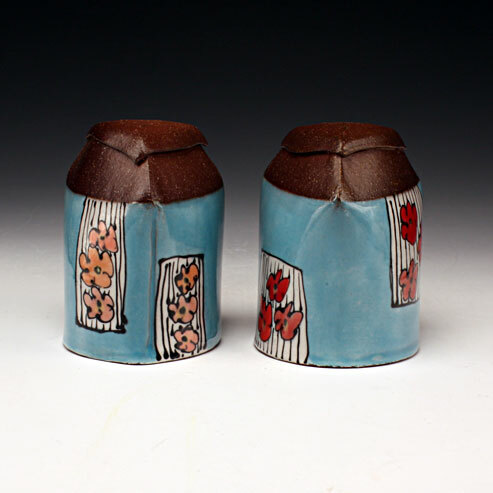 Michelle Miller, Julie Johnson, Elizabeth Robinson, Michael Kline, Melody Tiemann, Sanam Emami and Jenni Brant created cups and mug to hang alongside each other within Molly’s framework. It was a long distance collaboration capitalizing on each makers existing aesthetic. The result is an exhibition, which simultaneously inverts and merges with our winter wonderland. Perhaps it can remind us, whatever the season, we have much to revel in and there is always a warm cuppa waiting for us somewhere.